Led by St. Louis, Missouri is boosting its profile as a hub of innovation. 39 North is an ambitious effort to help solidify St. Louis as a hub for agriculture technology. Agtech, the intersection of agriculture and technology, includes research into plants and animals and the development of machines and chemicals to improve farming. Simple enough, at least by definition, But in practice, agtech requires deep dives into disciplines as esoteric and wide-ranging as plant genomics, digital data collection and management, infectious diseases, biotechnology, seed development, renewable energy and even drone technology. Peel away at agtech's many layers, and much of what you'll see occurs within a few square miles of St. Louis, Mo. "No other metro area in the world," reads a recent market assessment by the Brookings Institution, "can boast the scope and expertise of St. Louis' agtech/food tech sector." St. Louis, says Brookings, is uniquely positioned to promote itself as the "global bio solutions epicenter." "Agtech is St. Louis's fastest growing sector," says Sheila Sweeney, chief executive officer of the St. Louis Economic Development Partnership (SLEDP), the joint agency that promotes business growth in St. Louis and St. Louis County. "We have," says Sweeney, "an extraordinary pool of talent working in this sector." That talent resides within a cluster of institutions that's becoming bigger and more bountiful by the year. It includes Monsanto, the multi-national ag giant; the Donald Danforth Plant Science Center, an internationally recognized research lab considered the city's center of agtech innovation; BRDG (Bio Research & Development Growth) Park, home to 10 emerging scientific enterprises including firms from Germany, Israel and India; and Helix Center BioTech Incubator, which is owned and operated by SLEDP. Those ventures are the primary threads in a commercial, entrepreneurial and residential tapestry being woven in the St. Louis section of Creve Coeur. It's what a lot of cities talk about. Connectivity. In St. Louis, it's happening in the agtech space through a 10-year project called 39 North. Spearheaded by St. Louis County Executive Steve Stenger, 39 North is an effort to physically link the city's agtech assets through corridors of greenspace, residential property and businesses. A mix of city planning and business development, the project's master plan was funded by a $500,000 grant from the US Department of Commerce. The driving idea behind it is to create new jobs and lure top-notch talent through enhanced livability. "I believe 39 North is going to generate thousands of jobs for St. Louis County and our region," says Stenger. "And I think it is going to be a place and a space where people come to share ideas. Where they come to collaborate." The name 39 North pays homage to the idea that the 39th parallel of north latitude runs not only through St. Louis, but also connects the world's great agricultural belts. Backers of the project envision 400 new residential units, more than a half-million sq.-ft. of office space and 85,000 sq.-ft of retail to help solidify the ag cluster's identity and livability. The inclination of agtech startups to flee for the coasts after establishing themselves in St. Louis has been a source of frustration in the past. 39 North is seen as a way to position the city favorably relative to the coastal tech darlings. Keith Duncan, a research scientist at the Danforth Center, believes 39 North will promote added value within the area's burgeoning agtech cluster. "All the facilities that are now in the area will be bikeable, walkable, hikeable, runnable. It's going to be a fantastic place to be. It's going to make working hard very easy." Missouri's robust food production sector includes nearly 400 companies, with some of the top 100 food producers among them. PepsiCo, Tyson Foods, Nestle, Kraft Heinz, Coca-Cola, Anheuser Busch and General Mills each have food solutions facilities in Missouri. The state's agriculture industry contributes $33 billion in GDP to Missouri's economy and generates $88 billion in sales and more than 378,000 jobs. Kraft Heinz, in 2017, cut the ribbon on a $250 million expansion of its cold cuts facility in Kirksville, and announced months later that employment at the plant had doubled over the previous year to 900 employees; the plant has an output of nearly one million packages daily. PepsiCo, in 2017, opened a new distribution center that brought 75 new jobs to Poplar Bluff. Ajinomoto Windsor, also in 2017, announced plans for a frozen appetizer production plant in Joplin. The $39 million investment is to create an expected 200 jobs. 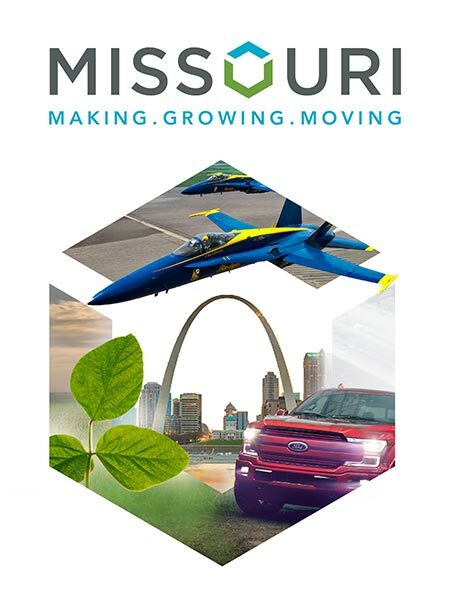 Missouri has the sixth-largest highway system in the US, and being at the nation's geographic crossroads, the state is within 500 miles of 43-percent of the US population. Colorado-based Aurora Organic Dairy cited Missouri's central location as crucial to its decision to construct its second diary in Columbia. "Columbia was the best choice," says Aurora's founder and CEO Mark Peperzak, "because it offers a location that expands and improves the efficiency of our supply chain." In May, 2017, Aurora broke ground on its $141 million Columbia facility, which is expected to create 90 jobs to start, with the possibility of up to 150 new jobs over the next five years.